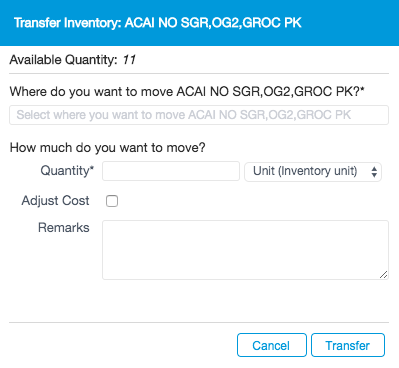 Within the Inventory section, you can transfer inventory from one establishment to another. This is useful for clients who run a warehouse establishment with multiple main establishments, but any client with multiple establishments can benefit from this feature. You can also transfer ingredients associated with a product to a new establishment. This helps establishments that want to prep products using ingredients at the new establishment. NOTE: Before moving inventory, products or ingredients must share the same barcode or SKU in both establishments. The establishment sending the products or ingredients must also have a positive quantity inventory of the products to transfer. 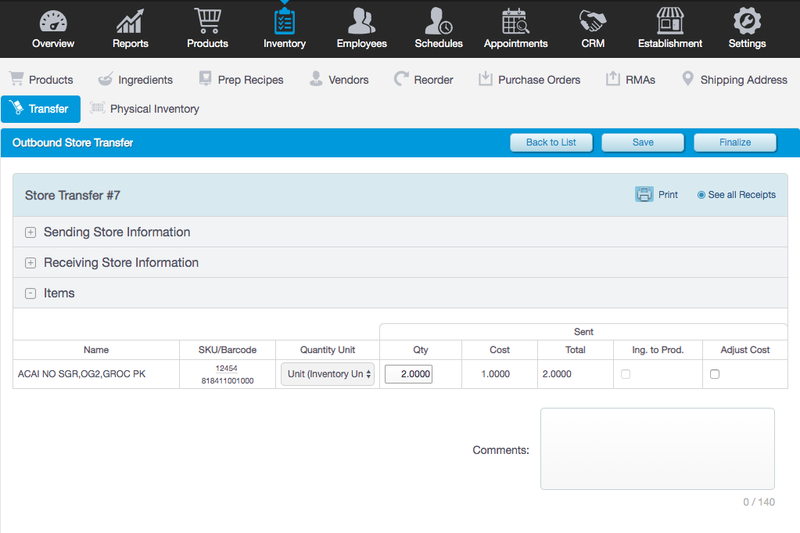 To transfer a product, navigate to Inventory > Products. To transfer an ingredient, navigate to Inventory > Ingredients. 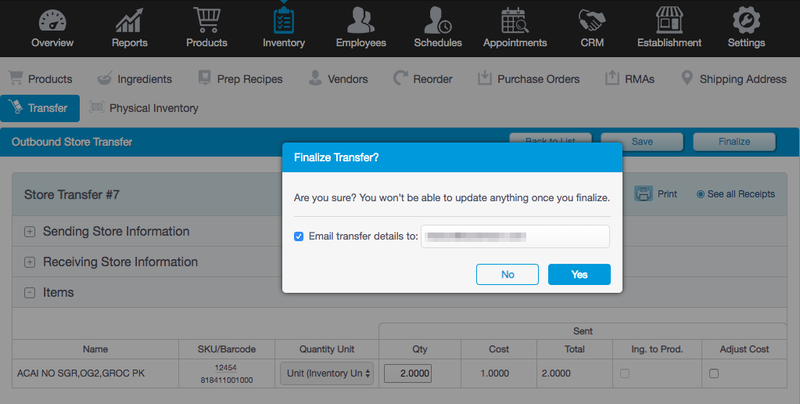 From the Management Console, navigate to Inventory > Transfer. Repeat these steps to add more products or ingredients. When you have finished adding products or ingredients, click Save. 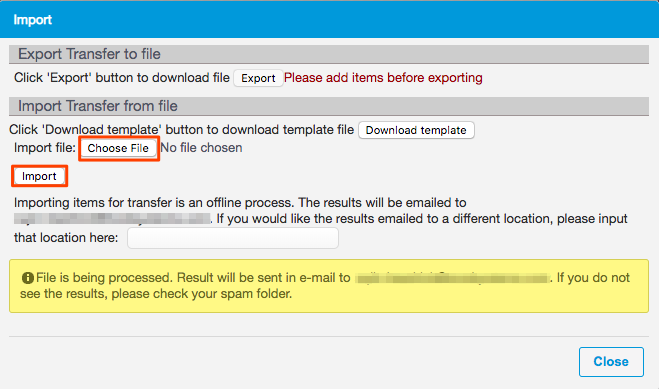 From the Management Console, navigate to Inventory > Transfer > Import/Export. Ingredient to Product: Enter Yes if the ingredient in the source establishment will be converted to a product in the destination establishment. Otherwise enter No. Update Cost: Enter Yes to update the cost based on the cost in the source establishment. Otherwise enter No. Source Establishment ID: The source establishment ID, located in the list of establishments. Destination Establishment ID: The destination establishment ID, located in the list of establishments. Barcode: The product or ingredient barcode. SKU: The product or ingredient SKU. Quantity: The quantity to transfer. Is Ingredient: Enter Yes if the item is an ingredient. Otherwise enter No. Save your file as an Excel spreadsheet.